Entry is open to UK residents only, aged 18 years and over, excluding any employees of Grosvenor Casinos or any other company linked to the prize draw in any way. Only one entry per household and IP address is permitted. The Competition begins at 11:00 on Thursday 7th February 2019 and ends at 15:00 on Friday 8th February 2019. One winner will be selected at random, with the prize being a £100 free bet for Grosvenor Casinos online. 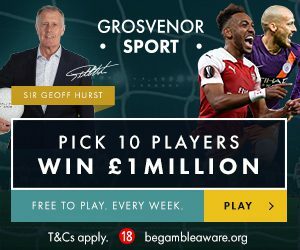 Winners will have to match or better Sir Geoff Hurst’s correct first goalscorer picks for the specific game week to win the prize. Only valid entries received during the Promotional Period will be eligible for inclusion in the prize draw. The draw will take place on Friday 8th February 2019 after the entry period has ended. One winner will be selected at random from all valid entries for the prize. Winners will be notified on Friday 8th February 2019 via private message. If a winner does not respond to the Promoter then the Promoter has the right to forfeit the prize.